Oh how I wish it were that easy. We want him back too. Seriously, though, if ANYONE has any connections with Justin Bieber, please use them! This is one time I think it's perfectly acceptable to play the sympathy card. And speaking of famous people, for Jack's Little League banquet in June, he had to fill out a questionnaire about himself. One question asked what famous person he'd most like to meet. His answer? "No one." After two emails back and forth between the sweet mom in charge and me, I finally asked him why he couldn't just choose someone. He said, "I just think it would be really awkward to meet someone famous. What would we talk about?" Good point. That kid knew how to make me smile. I'm so very sorry for your loss. I know commenting on your blog doesn't help anything, but know people are praying for you and have cried with you over your precious baby. I would have to agree with Jack. It would be really awkward. I wish I knew beiber. Sadly I do not. I'm sure Bieber puts on a great show but his hair will never look as good as Jack's. My son was best friends with a kid down the street who was born with a deformity in both arms. He didn't seem to care and taught Kevin how to pee outside so as not to cut into playtime. When that kid was asked to fill out a form and put who his favorite person was, he put my son's name. The teacher told me in all her years of passing that out, it was the 1st time a kid had named another student. I agree with Jack. Why spend time looking like a geek meeting a famous person when the neighbor kids can show you the best places to pee and not get caught by your mother freaking out. There's a limit to how useful the famous can be. Clearly, Jack figured that out pretty early. This may sound crazy but write to Ellen Degeneres...she does amazing things for people and this request seems like something she would make happen. Maybe we should all write to Ellen?!!? Anna, we do not know each other but I have been praying for you and your family. I have also been struck by your bravery, love, and tremendous faith. Your writing, your life, and your son have touched my life. In exchange, I wish I could take away even a small part of your grief. I loved this post and I *Loved* Jack's answer to that questionaire. What a sophisticated kid! If I had a Justin Beiber connection I would totally use it. I wish it were that easy too!! Makes my heart hurt for her. And man oh man do I wish I knew Bieber!! I hope someone does!! Speaking of which, we have been bitten by mosquitoes every night for the past few days/weeks. Seriously. In October? I was telling my husband about the Bridge story in the car today and trying so hard not to cry, but of course I broke down. I apologized to him that he had to marry such a basket case. I'm not sure he knew what he was in for when he asked me. But anyway, your story, your Jack, your humor as well as your pain lives on in the lives of your readers. Jack was wise beyond his years. I cannot imagine how much you are missing him, but I will tell you - your grace & faith in God is au-inspiring. Please know, I'm praying for your family. I've been reading your blog since I read about the tragedy on Miss Mustard Seed. You are in my thoughts daily. The list Margaret wrote it so sweet and so heartfelt! I took another commenter's suggestion and wrote to the Ellen show. Maybe if enough people write in, they will take note! How nice would it be to put a bright spot in your dark world by making Margaret's wish come true. Take care! I seriously wish I had connection with Justin Bieber. Continuing to pray for you Anna. my name is margaret too and can never imagine losing my older brothers. praying for her strength. I, too, have been reading your blog since Miss Mustard Seed told of your tragedy. My heart aches for your loss, and I think of you daily. Thank you for continuing to share your family. 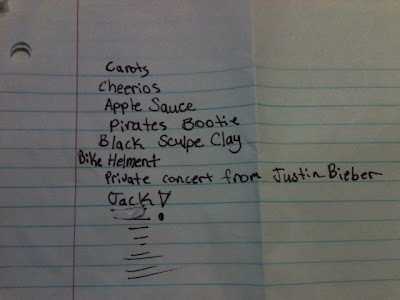 In hopes of easing Margaret's ache, I contacted Justin Bieber's management team regarding her "shopping list". I have no idea if they will contact you or what they can do for Margaret, but thought I'd let you know. Readers, you can Email Ellen here for Margaret. A recent tragedy has inspired a local community, and a virtual community. A 12 year old boy drowned in the floods of Hurricane Lee, in Vienna, VA. The mom is a blogger -- no, an exceptional writer and amazing mom who happens to blog -- and the word is spreading as she shares her story, bares her grief, and uplifts us all. Today's blogpost highlights the 10 year old sister. She wants to meet Justin Bieber. Maybe Ellen can make this happen, we are all wondering?! 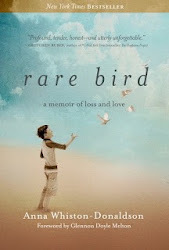 The story touches on the faith, community, grit, honesty, inspiration, support and rawness of life as it twists and turns; something Ellen's viewers would love. Please help this wish come true. I love your daughter's heart. Something tells me she gets it from you. If I knew Bieber, I'd send him your way!! Please, if you're a Twit (LOL) retweet one or the other! I sent an e-mail to Ellen, can't wait to see what happens. I think you need to warn Margaret that she may be disappointed when she meets the Beiber, he can't be as awesome as her brother was! Blessed are we who have had the blessing to have had something so precious that it's loss is so profound. Love and hugs, I'm always thinking of Jack, Margaret, and you and your husband. Just tweeted and wrote Ellen....fingers crossed! Oh wouldn't that be something if Ellen could make it happen!! P.S. Don't forget to get back to me with a date/time! The title of your post sums it all up. Margaret's list is great - she must be an amazing girl. Jack seems like an incredibly deep thinker for such a young guy. He's so right - it would be really awkward. I'd either cry, which is ridiculous, or freeze up. Hoping your hear from that Bieber boy! 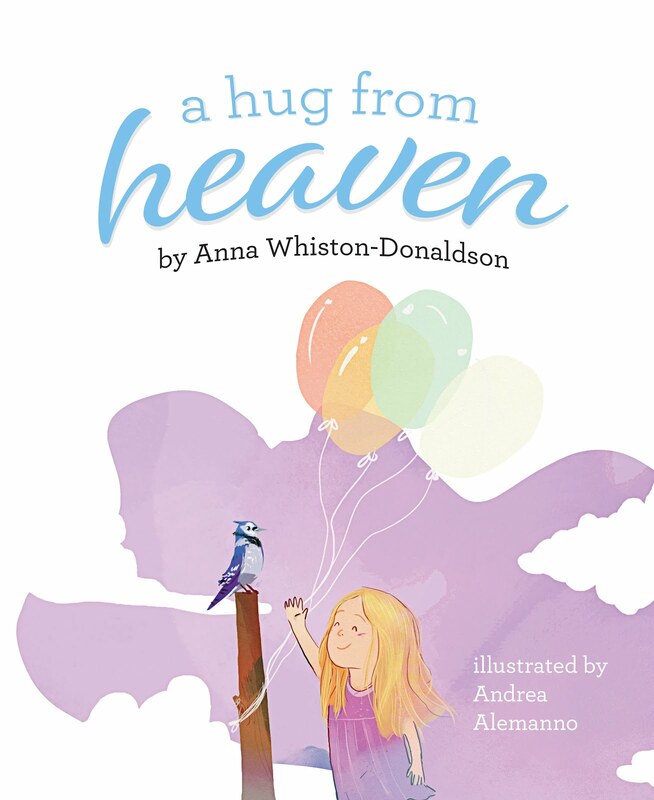 You can enter Margaret's story here. I already sent my note! Love the list! Anna, my 7 year old son, Zach, wanted me to tell you this~ today I was telling him about Jack and sharing with him your account of that night. I told him how happy you said Jack had been and how I was betting he was having the best time ever. We came to the point in our conversation wondering if there was a moment when Jack was scared, and this is what my son said, "When I almost drowned (at the waterpark) there wasn't time to be scared. The only thing I remember is waking up and people were looking at me. We agreed that last thing Jack had to have felt was joy! That beautiful girl and her list. I wish I knew Justin Bieber AND I wish I had the power to make wishes come true. All of them. Please keep writing about all the brilliant things your boy said. I love you and pray for you all day and every single song on the radio makes me think of you. also, i love your readers, anna. amazing. emailing ellen now. I was hesitant to check back because I was scared that people would think suggesting Ellen was too lighthearted for the occasion. Thank you to those that looked up the information...I will send something very soon. Margaret deserves to meet Justin Bieber and Anna deserves to see the smile on her face. Tweeting and RTing till my fingers are nubs. Brilliant little guy. And man, I am sooo against anything bieber usually...but for your girl... I'll keep my fingers crossed!!! We must get Bieber to you. I wrote to Ellen too! Anything I can remotely do to bring some happiness to your baby girl's face...and yours. That is one child who was wise beyond his years. Thank you so much for sharing him with us. I think your Jack was an "old soul"..and I think you know what that means. I do believe that there are people that are destined to lead shorter lives-but what they teach us in those years goes far beyond the physical age. Emailing Ellen now! Loving your dear Margaret. I have no words but so much love for your family. Xoxo. The Ellen idea is brilliant. That would be like a double whammy -- meeting JB AND getting to go on the Ellen Show. I love it. ALso, that Jack was a smart, smart soul! What an amazing girl you have. I love how she took the usual pragmatic "What do you want?" question for a shopping list to a whole new level. Thinking of you every day. It's so good to be able to come here to see how you're doing. I was going to say "holding up" but that's not really it, is it? Justin is adorable--and he's still got nothing on your Jack! I think whoever suggested Ellen is a genius! I'm widely known for missing the point, but...emails back and forth? Why couldn't his answer just be his answer? Does everyone have to want to meet someone "famous"? Waiting to see how the concert thing turns out. We have Beiber Fever in this house, too. I e-mailed Ellen. WOW! It wouuld be just awesome if we were actually able to make this happen! I have been keeping you all in my thoughts and prayers. I imagine it will be a long and difficult journey for you all. It's not much, but I hope it brings some comfort to know that there are people out there; strangers, who do care. I e-mailed Ellen as well. I hope good things come your way. Funny. I finished reading this entry yesterday and immediately fired an email off to JB's manager. Now that I read the comments, looks like all of our great minds think alike. Hope something comes out of it. My thoughts are with you and your family always. I remember making lists like that after my daughter died. Praying for peace for everyone in your home. How sweet is she!!! I emailed Ellen too (thanks for the info Meredith!)! I am praying we can all make something amazing happy to bring joy to sweet Margaret. Continuing to pray for you and your family, Anna! now and was profoundly effect by your lost. Let's see what your virtual family can do for you and your sweet Margaret! I love her! What a spirit she has, and what a wonderful environment you must have created for her to be able to say how she feels! My husbands mother died when he was 12 and he was told not to ever talk about her again, to the point that he really doesn't remember a thing about her. Sad, but that was a different time. Still praying for you guys. Gotta go write Ellen! I hope so badly that Margaret can see this "tiny" wish come true. I wrote Ellen, posted Lady Jennie's post on my FB page (asking others to do the same), emailed all of my contacts/friends requesting they do the same, and tweeted. I believe we can make this wish come true through the power of social media. I think about you and your family every day, Anna. I was an aquaintence of yours from JMU and remember going to Key West with you and a group of girls freshman year -- and the horrible phone call you received about your mother. I have never forgotten that. And I will never forget this and pray for you and your family every day. For those of you that are taking the snail mail approach with Ellen you might consider doing what I will do when I write my letter. I am going to draw a big blue bow on the envelope for Jack. If enough of us writing do this, Ellen's mail sorters may catch on and start looking for them. I might also use a large envelope, the kind you wouldn't have to fold your letter in. On a side note, I always wanted to meet Dixie Carter, maybe Jack has bumped in to her. Please keep sharing your stories about Jack. I believe that even when somebody is gone their story is meant to live on. Thanks for sharing the story of Jack with us. Tweeting and writing Ellen today! The Ellen Show is Perfect! Anna we have not met but I grew up Glen Cannon, played in that creek, had friends that lived on Marcliff and I'm friends with Kate L. and Tristan B. I feel like I know you. I have been praying for your family. And the cherry on top I have a friend who works for Justin Bieber! I'm going to do whatever I can do to help. anna, you are an inspiration to so many people. Thank you for sharing your story. I am praying for you and your family. On a side note l have a friend who works for ellen. I will send him an email. God bless you. You know what I love about Margaret's list? That she underlined Jack's name a zillion times. And that she felt so comfortable writing it there and not like she couldn't talk about Jack without making you guys sad. She obviously knows that you're all in this together, and that just shows how wonderful you all are. I've retweeted both links listed amongst the comments and I also tweeted directly to Ellen's Show with a link to this particular blog entry so her staff could read it for themselves. You can tweet your own version asking for help by addressing your tweet to TheEllenShow: http://twitter.com/#!/TheEllenShow I pray this campaign is successful for Margaret! 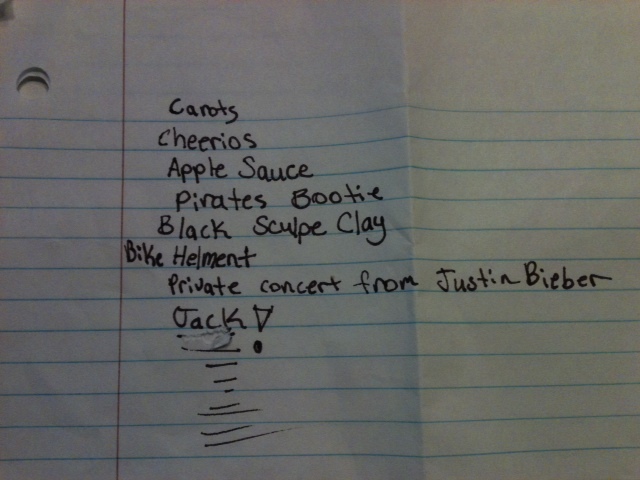 The entire list made me smile--the content, the spelling. Margaret is precious. I hope you guys got her that "helment." Wrote to the Ellen Show on Margaret's behalf. Love her little heart and spirit, and her infectious laugh. It's likely nowhere near close to her wishes, but with my new haircut and glasses, I fear I'm edging dangerously close toward looking like a 43-year-old female Justin Bieber impersonator. If I could pull it off for her, I'd do it and I'd even come out for an encore. Instead, I'll hope she gets that part of her list, and I'll keep you all in my prayers. Miss Mustard Seed posted about your story- I am so very sorry for your loss. I will spread the word and hope that it reaches him. Sending good thoughts and prayers to your family. I've been reading your blog a bit today, with tears and chills and an aching heart. I'm just SO sorry and sad that you lost your son. I hope your daughter's dream of meeting Justin can come true. And I hope you can all have some peace knowing that you'll see Jack again some day. We haven't met , but you attend our church. Your blog is truly an inspiration and I read it with tears. I am reminded to hug my 2 boys often....now even more. You are a gifted writer. I, too , will write to Ellen about Justin. I'm so very sorry for your loss. I have no words, but have been thinking of you, even if I've never met your family. I'll share your blog on my Facebook page, you never know where it ends up. I hope someone can at least fulfill that wish for your daughter. I sent Justin Bieber a tweet with a link to your daughter's shopping list. I hope he sees it.